Tee shirt design available at Iris' Shirt Shop. Today's National Health Blog Post Month prompt asks for my advice for someone caring for a patient with my condition. 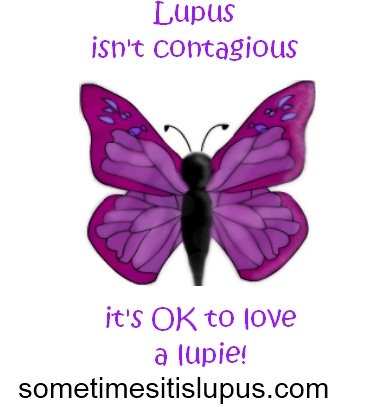 It's a question that spouses or caregivers sometimes ask on the Sometimes, it is Lupus Facebook Page. I'm always glad to find someone asking, because it means they really do care enough to find out. And I'm guessing that the kind of people who ask already do a great job, because they actually do care. So what would I tell a spouse or best friend or caregiver? Probably the thing that will make life most difficult for both you and your lupie is that lupus is so changeable. One day your lupie may be well and able to handle anything anyone else can, and the next day be too sore and tired to get out of bed. It means being flexible. You have make plans on a contingency basis - we will go to the movies, but if it's a sick day, we'll watch a DVD at home rugged up in a soft blanket. Sometimes your lupie will help out with the housework, or even do most of it, and some days you'll be left with the lot. You may get frustrated, but so does your lupie. Brain fog is another big issue. Your lupie may be an incredibly intelligent person, who may even have a post-graduate education, but on some days he or she won't remember to take pills, turn off the stove, or how to add up. It's frustrating for both of you, but it's temporary. Like everything else with lupus, brain fog flares and goes into remission. Try not to make a big deal of the problems created - your lupie's already frustrated with not being able to think clearly, if you stress as well it will only make things worse. Help them make sure there are reminders and alarms for everything important (like time to take pills, when to go to appointments, etc.) If your lupie has 50 alarms on the phone for different things he/she has to do for the day, at least there's a good chance those things will get done. Pain and depression go together. If your lupie's in pain she or he will probably also be feeling miserable. Try to be sympathetic. A lot falls on you to be the support person. Make sure you also have some support. Trusted friends or family members, a support network either on-line or in the real world will make a difference. Make sure you get some rest as well. That's not always easy, but caring for yourself is important. Carers need care too. If you're a spouse or partner, remember you're not just a carer, you're also in a relationship. You need to find ways of keeping your love growing. It's harder to go out, but lighting a candle and putting on soft music at dinner time is not much extra effort. Taking time to stop and talk and keep in close contact with each other's lives is important. If you're a best friend, doing best friend stuff is important, having coffee together, chilling out, matters. Sometimes a phone call or a hug (usually very gentle, depending on what's sore) can make a world of difference to someone struggling with pain. And encourage your lupie to do what he or she is able to do at any given time. (It will vary.) From a lupie's point of view, feeling that we have nothing of value to contribute to society or even those closest to us is very upsetting. When we're able, we really do want to do things that will be of value to others. Very good description of what it really means to be a support person, mostly about having yourself some support, as you said so well "Carers need care too". I can't remember if you have already written about it (I think yes), but accepting some help isn't easy as well.